Enhance your day with a Diamond Experience! Our Experiences offer you the chance to try Zermatt a little differently. Whether you’d like to explore a new area, try a new skill or even if you’re just looking for some inspiration, let us help make your holiday unique! 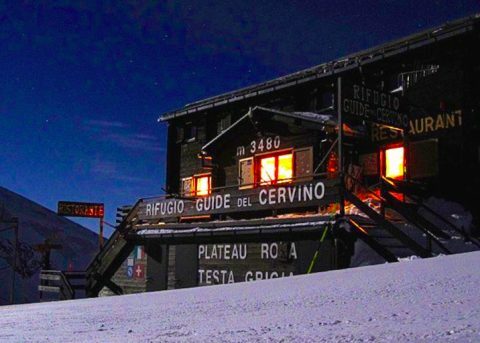 We pick you up, first thing in the morning, for a helicopter flight or lift ride, before guiding you into Italy — including some backcountry skiing if conditions are suitable. You can get your morning coffee hit, and maybe sample some local snacks as well, while taking in the breath-taking views over the valley from the kind of cafe that only Italy provides. Then there will be ice karting in Cervinia village, before cruising to a lunch of regional delicacies at an excellent traditional restaurant. Finally we will ski back, well-ballasted and content, over the border into Switzerland. Get back in touch with nature with an early-morning tour of the natural environment of Zermatt, either on foot or on skis. Here you can explore the still quiet runs or walking paths before trying your hand at clay-pigeon shooting at Furi. After a brief lesson you’ll be competing with your friends to win the title! 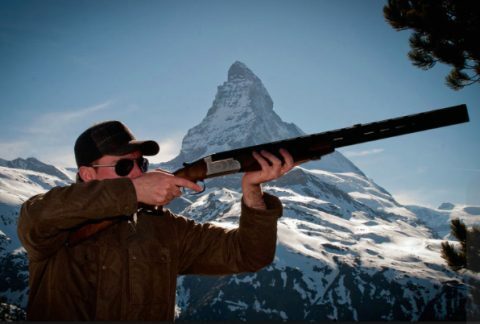 As your reward, then enjoy a typical alpine hunter’s lunch of locally shot game at an excellent nearby restaurant. After that, spend the afternoon sledging or skiing with our instructors who can provide you with any tips you need! We collect you early in the afternoon and, depending on how energetic you are feeling, you can either skin up, or ski down to a mountain hut on the border with Italy. There you stay overnight, whiling away the early evening watching the sunset over Italy and sipping Italian après-ski beverages. A fantastic evening meal in the hut follows, washed down with the excellent local Valdostana wines, before retiring to bed. Woken early by the sun, you can enjoy a quick breakfast in the mountain hut. 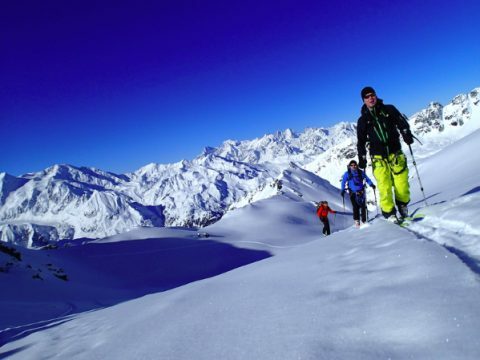 Then you’ll be able to make first tracks down empty slopes into the villages of Valtournenche and Cervinia. For lunch, we’ll take you to a farmer’s restaurant to enjoy delicious local produce, before heading back towards Switzerland. However we can make one last stop on the border to say goodbye to your sunny day of dolce vita. We take you up to the Klein Matterhorn, helping entertain your children on the way, before skiing into sunny Italy. En route you can stop to try the delicious Italian hot chocolate at a lovely cafe spectacularly overlooking the valley. We then start to return towards Switzerland, but not before stopping in a regional restaurant, and allowing you to unwind. As our instructor will be with your children, there’s nothing to stop you doing a couple of extra laps. That way everyone gets the most from their day together. We start by helping you choose some skates so you can have a go at gliding across the ice on one of the village rinks. After that, we arrange for a pizza or pasta lunch. 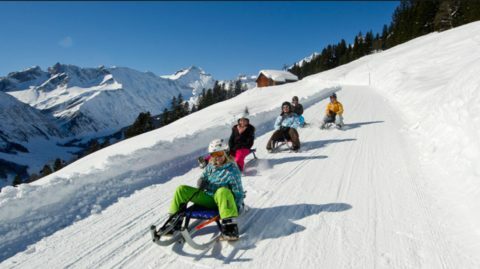 Once everyone is satisfied, we take you all up the mountain with sledges. Here you can enjoy the afternoon tobogganing, perhaps stopping in a little hut for a hot chocolate on the way! We meet you at your hotel, and take your children to get their boots and skis ready for the day. Then we take them up the mountain to ski for the morning: working, say, on their parallel turns or maybe learning the basics of mogul skiing. 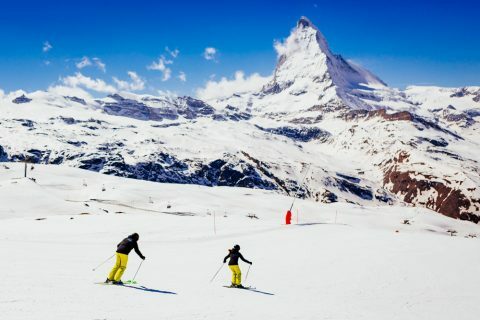 At lunchtime, we bring the children to meet up with you at one of those delightful mountain restaurants with heart-stopping views of the Matterhorn and surrounding valley for which Zermatt is so rightly famous. 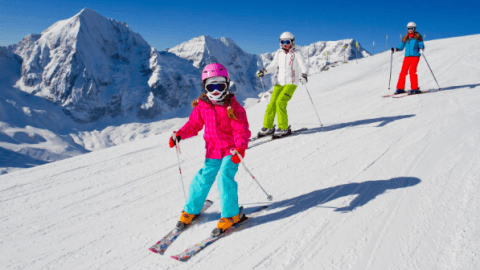 In the afternoon, either you can ski together with the children and the instructor, so the children can show you what they have learned and you get the opportunity of picking up a few tips, or we can take the children away for more skiing, or perhaps even sledging. At the end of the day, we can drop them back with you at your hotel, tired out and happy! The above are suggestions of what we could offer you, but if there is something specific you would like us to organise for you, let us know!